A TRANQUIL BISHOP SCHARFENBERGER during the papal Mass at Madison Square Garden in New York City. 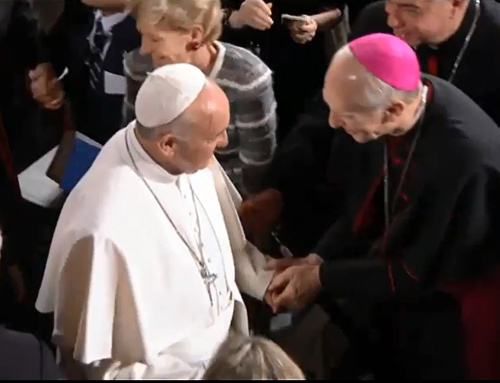 Bishop Emeritus Howard J. Hubbard gets to shake Pope Francis' hand during the pope's visit to the 9/11 Memorial in New York. If there is one thing that I suspect I will always remember about the days of Pope Francis among us, it is the deep peace I felt in his presence. Those of you who, I am told, caught me on TV at Madison Square Garden in New York City Sept. 25 might have read that on my face. It actually surprised me! Not only was that surprising, but so was the peace that seems to remain, even though Pope Francis has returned to his particular place in Rome. Could peace become a "new normal" for us? There is no doubt that is God's desire. We may remember that peace is the parting gift of Jesus to the whole world. It is not just a wish, but a promise: "My peace I give to you" (Jn 14:27). And that promise is ensured by His presence. The Prince of Peace -- to whom the Holy Father made frequent reference during his homily in the Garden -- is in the city, he said. God wants you to have His peace! I am sure that the city to which Pope Francis refers is not just New York City. He uses the Spanish word "pueblo," which is rich in meaning. It includes not only the place where people live together, but all of the people who are there, including those who do not have any place to call their own. For Pope Francis, the "pueblo" becomes a metaphor of God's presence to all people, personally and through one another. A deep sense of that presence is possible for people of faith who bring their faith with them to the sacramental assembly which we call holy Mass. What distinguishes this gathering from others is the assurance of Jesus Himself of His real and personal presence in the Eucharist every time it is celebrated. The Mass is not just a memory. The Mass is God's presence! What struck me during Mass in the Garden was not so much what was said or sung, but the unusual calm and feeling of togetherness -- and this, in spite of the cavernous space, embracing some 25,000 that night. Yes, here and in other places where Pope Francis celebrated Mass, many had to wait long and patiently while rigorous security measures were painstakingly employed - not the ideal way to prepare for Mass! Yet the power of God's presence seemed almost palpable around Pope Francis. It wasn't anything in particular that he said throughout his journey among us. Before he even set foot on our shores, he had indicated his main reason for coming. Responding to a young inquirer at a virtual audience televised a few weeks ago, he said that he wanted to come to the United States so he could be close to all of us. 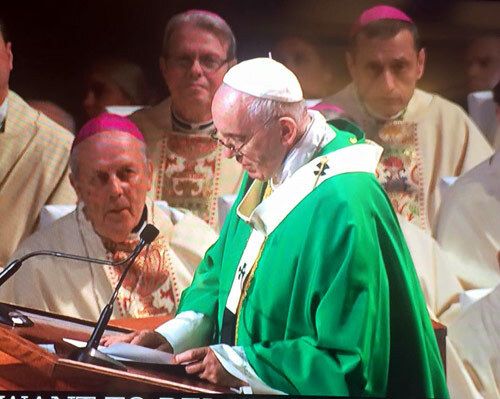 In the spirit (if not the historically certifiable words) of St. Francis -- "Preach always; use words if necessary" -- Pope Francis breathed new hope into the hearts of anyone who witnessed his actions. Drawn to embrace prisoners, the homeless and ailing, and persons with disabilities, we saw him gently but firmly leading his entire flock into the margins of our society and even beyond. His appeal to the humanity of immigrants and all human beings, regardless of age, status or stage of development, was not only one of words, but of exemplary actions. This, he is inviting us to discover, is the way the Gospel looks. Evangelizing -- or "Gospel-ing" -- is a powerful witness of the peaceful presence of God. The presence to which Pope Francis witnesses is focused intensely on active listening: being with the other person in an active and respectful manner in order to invite a true "encounter," as he puts it, not just a dialogue or conversation in which words or even feelings might be exchanged, but not really received within the heart and contemplated. Mary is revealed to us as the model and font of God's presence to us. In the Scriptures, we see her contemplating Christ's words and movements in her heart, pointing others to her Son at Cana, standing at the foot of the Cross. In Madison Square Garden, significantly, an image of Our Lady of Guadalupe stood just to the right of the altar, as if to remind us of Mary's presence there and at all of our "Calvaries." Through her heart is our most direct route to the heart of Jesus, for she is always present to Him. Her role, like that of all of us united in our Christian faith, is to make God's presence visible and felt in the world. This presence has real consequences. On his last day in America, Pope Francis challenged families very directly. If I heard him correctly, he asked them to take the time to pray together and listen to each other, adding pointed admonitions against yelling and shouting at home. God's presence brings peace and harmony. Over the baptismal font at the entrance to our own Cathedral of the Immaculate Conception in Albany hangs the image of Our Lady of Guadalupe. Mary is the font through which Jesus entered the world and the one who accompanies each of us on our road to heaven. During the month of October, which is dedicated to Mary's special gift of the Rosary to us, I would invite everyone, especially families, to join with me in praying for one another daily as we approach the Holy Year of Mercy -- set to begin Dec. 8, the Solemnity of the Immaculate Conception, patroness of our Diocese of Albany. As I continue to travel around the Diocese, I intend to join in the Rosary, the powerful prayer of God's presence. Although Mary is deeply honored by this prayer, its entire focus is on Jesus, the fruit of her womb. Each "Hail Mary" begins with the announcement of God's presence coming into the world through Mary's "fiat" or "yes." Through her free consent, the Annunciation becomes the "dawn of mercy." What mother does not treasure the story of her child? Think of the Rosary and all of the pictures and scenes its mysteries invoke as Mary's photo album of her Son, Jesus. And what more fitting way to prepare for the Year of Mercy than to invoke the intercession of Mary throughout October and to prepare ourselves and our entire Diocese for a consecration to her immaculate heart?